In two-and-a-half months, the world of Islam will suffer its fractures again as one “madhab” (school of thought, sect) goes for Eid according to whether the First Moon is seen on day ‘x’, while another goes for a date according to whether the great Lords of Islam in Arabia, decide that the Moon shall be seen on day ‘y’ and yet another will base it according to whether their “ulema” (scholars) have decreed it to be so or not. I place them (“tradition”, “Sunnah”, “madhab”, “ulema”) in quotes, because the subject has NOTHING to do with any of these things. Sadly for these schools of thought, these scholars and these political or faith-leaders, God does not consult with them before allowing the Heavens to move in certain ways; the Moon is either there, or it is not and no amount of argument is going to change that. Some Muslims insist that the “Sunnah” requires that we actually SEE…eyeball, the Moon before we may declare the start or the end of Ramadan or, when Eid will be held, because that is what the Prophet Mohammed used to do and anything he did, can only be the ultimate in perfection…and who are we to argue against perfection. This is a classic case of diversionary tactics the take away the powers of reasoning and replace them with abject, voluntary, ignorance under the cover of being Islamic. There were a lot of things the prophet Mohammed used to do, that we do not do because science and modernity have replaced those practices with more certain, safer and more efficient practices, it has nothing to do with the sacredness of the prophet Mohammed’s life. We no longer cook with scavenged wood, we use gas or electricity. We no longer travel on camel or horse, we take our cars, get on buses and trains or fly on airplanes (Fatherland Security permitting). It does not matter if there are two witnesses telling us the Mr. X was not at the murder site, we look at photographic evidence, check fingerprints and blood samples and then decide whether the person is guilty or not. Prayer times are also not determined on whether we can distinguish between a white and a black thread or not or, whether the sun’s position is this or that; we look at our watches and worry that we might be late for prayers. All these are examples of science allowing for more certainty and science making life more efficient, more comfortable and more predictable in order that we may be better prepared. Imagine, not checking our watches for prayer times. people would trickle to the mosque at different times, there would be no congregation Friday prayers because some might not make it on time…”time”? what is “time”? we can’t possibly insert (expletive) science in religion…not in Islam! Think of how ridiculous life would become if Muslims decided on the chaos of personal witness to now-normal practices of Muslims. So, why are Muslims so desperately stuck on unscientific ways to predict the Moon phases? I would suggest this is all about control and the desire to prove that MY madhab is the only Truth and all others are verging on heresy. I am not suggesting that there are conniving mullahs who knowingly oppose things that are not of their own madhab, just that the traditions built by different madahib are then held by a death-grip that basically, is founded on control and being right…and by extension, others being wrong. The capacity to forecast the phase of the Moon is not new, there are public clocks in public squares that show the phase of the moon along with time, such as in Prague (first illustration), that was built back in 1410. 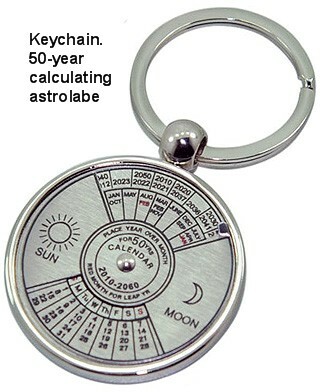 The Astrolabe at the end, was made in Baghdad in 1131 and the one in the middle, is my working keychain model of another Muslim astrolabe design from several hundred years ago, now sold through the 1001 Muslim Inventions in London; it can calculate dates and Moon phases up to fifty years in the future. Today, we have much improved on the old science of astrolabes and we can mathematically predict the phases of the Moon into the next millennium. The US Naval Observatory can tell us exactly what phase the Moon will be in, at any given time and at any given location on Earth (phases are different at different locations), yet, Muslims ignore these sources. It would make life so much simpler for Muslims if we were to adopt scientific methodology to support our calendar. Here in Seattle, Muslims have trouble reserving a place to pray for Eid prayers when thousands of Muslims gather to pray. The facility wants to know which date we would like to reserve (and pay an advance) for, but we are unable to identify a specific date even a three days in advance, because we do not know what the caprices of our faith-leaders will lead us to. Muslims would like to take a holiday on Eid, but since they cannot decide what date they would like off, sometimes, their employers cannot let them go at the last minute…and I mean “last minute”, how often have we been informed late in the night, that Eid is the next day? We would like our kids to be able to take a day off from school…but again, we face the same question of unpredictability, that makes it impossible to plan in advance. A common approach to our holy days will also facilitate more cooperation with other madahib (schools of thought, sects) or at least, it will be one less bone of contention. Right now, we are mired on the ridiculous situation where Muslims are observing the same religious event on three different days because they cannot decide on the same standards of observing the phases of the Moon. Pardon the pun, but it is Luni! We continue to pray that this year, sanity will prevail and our Muslim brothers and sisters will realize that the phases of the Moon are not political events, nor are they a measure of one’s faith. The famous Islamic quote “do not put loyalty above truth. It is the root cause of evil”. One can likewise say “do not put loyalty above logic. It is the root cause of division”. But when you do that, immediately you are told, this is the way of God and the prophet, and who the heck are you, a mere mortal, to question the rulings of Allah and His messenger…. never mind the fact that if they had better viewing devices in the 7th century than their naked eye, they would have surely used it. Well explained Jeff. All muslim sects should start agreeing to using astrology for moon siting. There is more unity and less confusion in celebrating Eid on the same day.